Legend has it that Atari buried a massive stock of unsold E.T. cartridge alongside Atari hardware and other games in an Alamogordo, New Mexico landfill after the famous 1983 video game crash. The Alamogordo Daily News reported in September 1983 that between 10 and 20 semi-trailers from an Atari facility in El Paso, Texas were buried at the landfill. Sounds like an urban legend and you would wouldn’t be alone in thinking that. However, the story even appeared in The New York Times, and an Atari spokesman confirmed the report at the time. 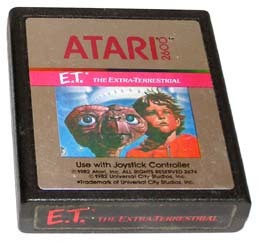 No specific Atari merchandise was mentioned to have been dumped, many reports have stated that upwards of 3.5 million copies of the 2600 game E.T. The Extra Terrestrial be found in the mythical landfill. It seems entirely probable that the Atari dump contains a wide variety of Atari game consoles and computer hardware not to mention unsold video game cartridges. Fuel Entertainment has received permission from the city to excavate the site on April 26, 2014. They plan on creating a documentary film surrounding the myths, facts and exploration of this legend. The general public has been invited to attend this dig, so if you’re an Atari fan and in the area, be sure to attend! 2014 would appear to be the biggest year of the E.T. game since 1983 as the Angry Video Game Nerd has also based his first feature film about the landfill with an outlandish quest to discover it.